The standard height Double Arm Mixer with hydraulic tilt was the first of Aaron's mixer line. The Aaron unit is furnished with the widest selection of standard features and options available in the industry. Aaron combines yesterday's experience with the technical knowledge of today to produce machinery servicing the needs of industry into the future. Aaron 50 gallon heavy duty mixer. Available with up to 60HP drive. 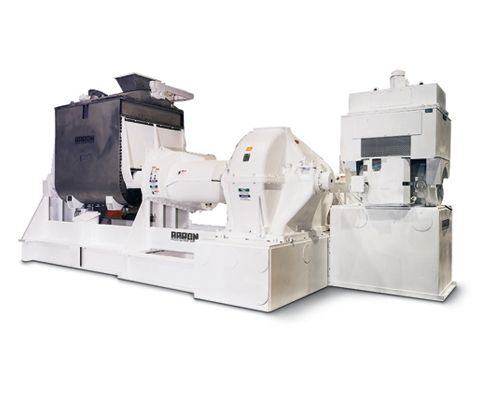 Standard configuration utilizes sigma tangental blades, 50HP drive, hydraulic tilt, jacketed bowl and vacuum cover.